The youth of the modern era are at crossroads, inclining towards globalization. The time is ripe for them to know that globalization stands for inculcating moral, spiritual & social values, and not disregarding them. Swami Vivekananda is universally recognized as having kindled the energy, enthusiasm, patriotism & self-confidence in people, which have led them to be acquainted with India’s culture & tradition, and the quest to preserve this rich heritage. Now the whole world is paying tribute to him, and his intellectual & spiritual ideas are being accepted widely by all. In every field of action and every mode of thought his teachings give inspiration and offer solutions for every problem. On the auspicious occasion of Swami Vivekananda’s 150th birth anniversary celebrations, we are glad to present Swami Vivekananda’s Wisdom for Daily Inspiration. 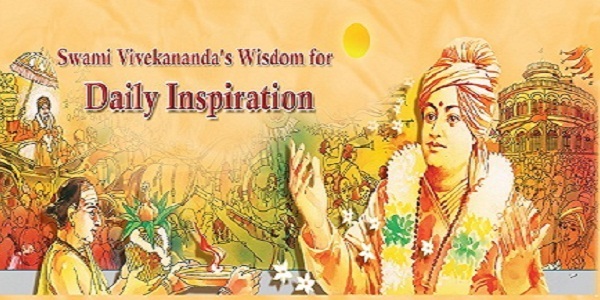 These inspiring quotations are collected from the Complete Works of Swami Vivekananda and references are given for all of them. We hope this publication will be adored by the readers and its influence will reach every corner of the land. If they read one quote daily and put it into practice, they are sure to achieve great heights in life.